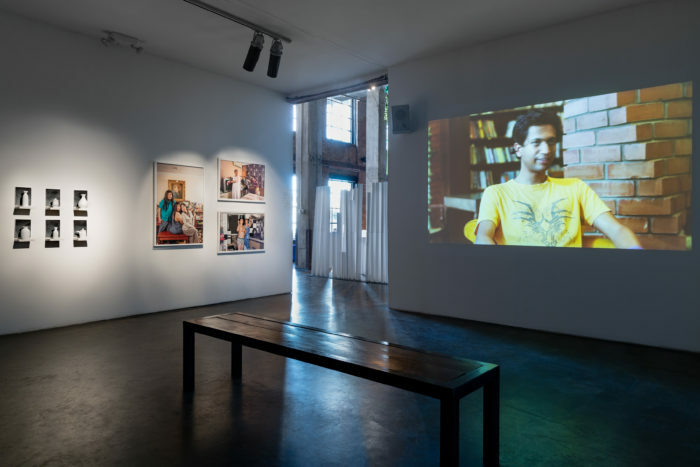 UPROOT curated by Gabriel de Guzman at Smack Mellon, installation view. Photo by Etienne Frossard. 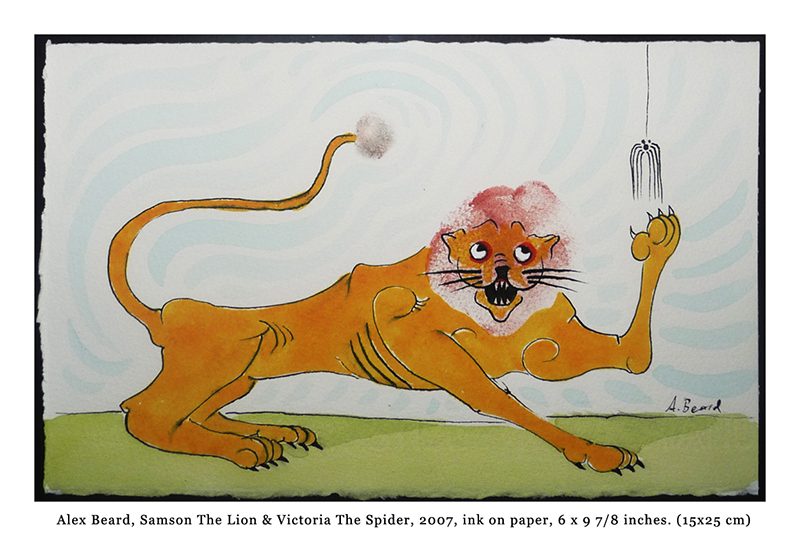 What do a stuffed lion toy, portrait of a family with the dad in drag, and a painting of interlocking arms all have in common? They are part of a magnificent exhibition currently showing at Smack Mellon curated by Gabriel de Guzman. As artists reflect on what has transpired in our country since the current president took office, the results of their thoughts, opinions and feelings are as varied and diverse as one could imagine. 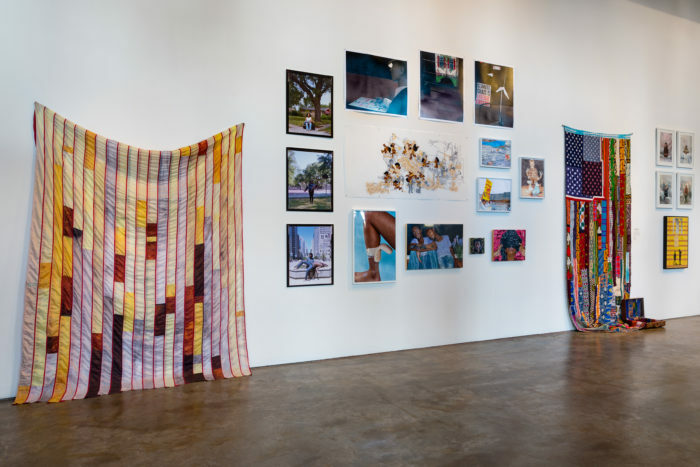 Without a little bit of background, anyone who walks into Smack Mellon’s current show, UPROOT, might wonder what the connecting thread is among the numerous works of art. 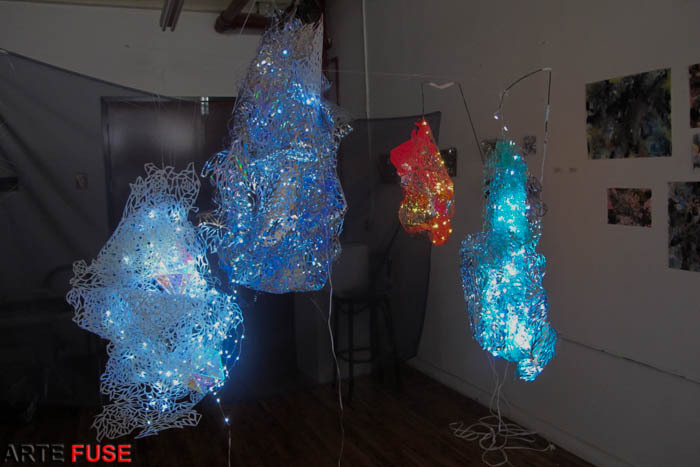 There are installations, portraits, sculpture and other expressions from over 50 artists. 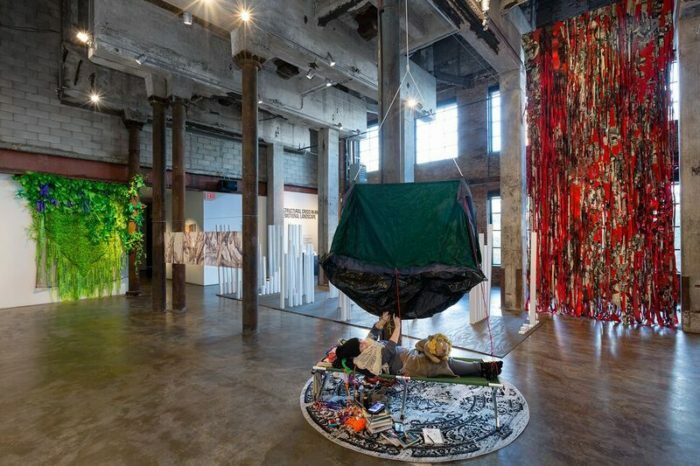 The art space itself is an industrial warehouse-like space with high ceilings that allow for the display of so many varied works without a cramped feeling and gives each artist their own special space. I found it easy and comfortable to stroll through and enjoy the work giving each piece the attention it deserves. Jon Henry, “Untitled #19, Magnificent Mile, IL” (2016), digital archival print, 30 x 24 inches (courtesy of the artist). The first thing that caught my eye as I walked in, was a series of three portraits that feature a woman holding a male in her arms, each at varying ages. The above example by Jon Henry called “Untitled 19” was taken on Magnificent Mile in IL in 2016. The man in the photo is the eldest of the three males featured in the series. The other two are children in a similar pose. A little bit of context for those readers who aren’t familiar with Chicago: The Magnificent Mile is an upscale area of the city where the commercial rent is one of the highest in the country, third only to Fifth Avenue and Rodeo Drive. As you’ll notice, in the background it’s business as usual. In the foreground . . .
Zhiyuan Yang, “A Family of Three #1” (2016), inkjet print, 24 x 36 inches (courtesy of the artist). Something that we may not be cognizant of as we live our day-to-day lives is how everything is connected. If that really is the case, any event that we share as a country can change and shape something as intimate as family. What exactly is happening in the below family? Zhiyuan Yang from Beijing, China has created an image that stops viewers in their tracks. The work challenges social and gender norms and uses humor to investigate serious subjects. What events may have transpired that lead to the moment pictured? How have these people been impacted by their lives outside of the family? What is the artist saying politically? The photo is called “Family of 3 #1”. The other portraits in the series are just as arresting. UPROOT installation view. 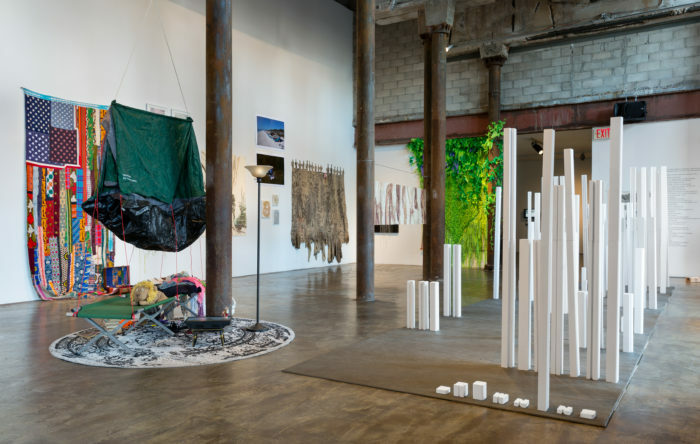 Left to right: Borinquen Gallo “Green Unplugged (Expanded)” (2017), debris netting, plastic bags, caution tape and URL cables; Diana Schmertz, “America’s Social Contract” (2017), watercolor on laser cut paper; Katya Grokhovsky’s “Temporary Habitat” (2017), Found objects, tent, cot, TV sets, media player, cables, fabric, lamps, books, video, performance; Sara Jimenez “Silent Malady” (2017), inkjet prints and mixed media (photo by Etienne Frossard, courtesy Smack Mellon). “Temporary Habitat” by Ukraine-born Katya Grokhovsky reminds me of time spent as a child camping out in my backyard. How silly it was for us kids to pitch a tent and “camp” with our family’s home a few feet away. At any moment we could go inside and get more snacks, use the bathroom or abandon the camp altogether and climb into a warm bed. The artist specifically addresses the subject of displacement in her work. Someone who may have been displaced as a refugee might see something completely different from my warm fuzzy memories. The installation feels open and invites the viewer to inject themselves into the space. The found objects she’s utilized and the video that is part of the installation give a good insight into what the artist had in mind in creating the piece. Seeing it in person is a visceral experience. Karolina Ziulkoski and Andrea Wolf, “Future Past News” (2016), Interactive Augmented Reality installation, 70 x 90 x 90 inches (installation), 8 minutes (video) (photo by Etienne Frossard, courtesy of Smack Mellon). 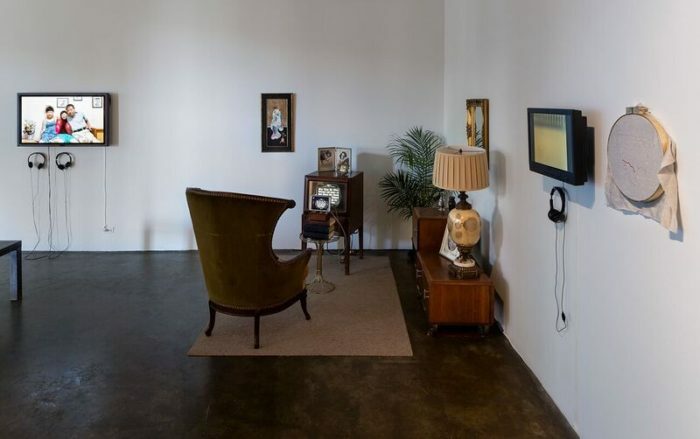 Karolina Ziulkoski and Andrea Wolf collaborated to create “Future Past News”, an installation that simulates a vintage living room circa 1937. They did a fabulous job of making the space feel authentic and warm. The artists comment on the repetition of history by including a newsreel from 80 years ago. The events in the video are so similar to what’s happening today it’s spooky. 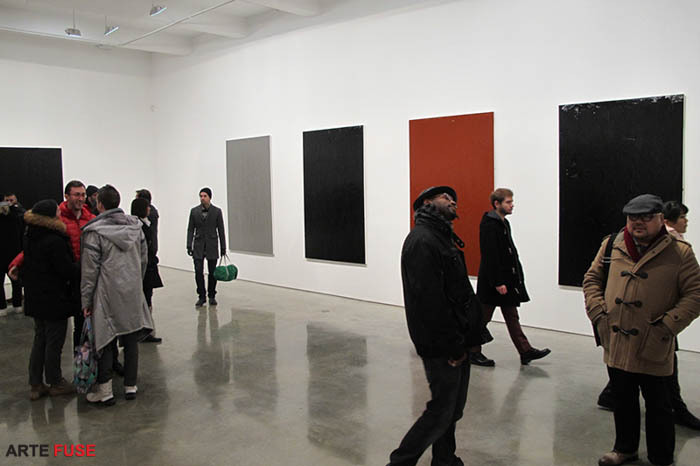 Viewers will notice how peaceful and pleasant the space feels compared to the subject matter that the piece deals with. Sara Jimenez “Silent Malady”, inkjet prints and mixed media (photo courtesy the artist). In “Silent Malady”, Sara Jimenez used both military camouflage and photographs from a time in the history of the Philippines when they were fighting United States colonization, circa late 1800’s. Similar to the Ziulkoski/Wolf collaboration above, her work is an example of how art based on a narrative that took place in the past is currently relevant. 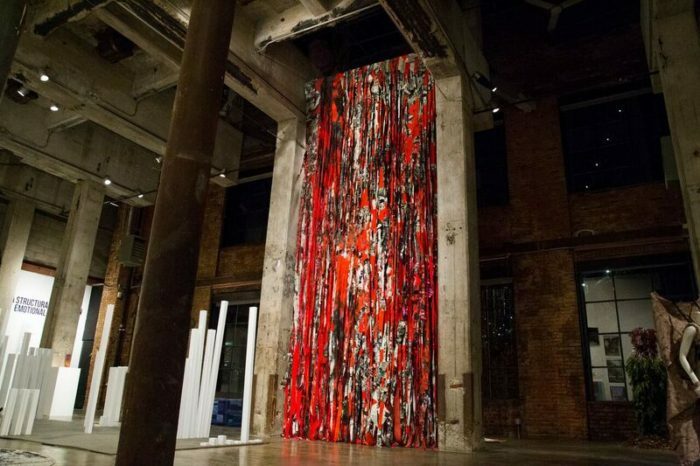 The piece, with an impressive length that practically spans ceiling to floor, is characterized by a fringing technique that makes it come alive. Much of what has transpired in the past two years has no rhyme or reason and can be challenging to even think about. What’s encouraging about UPROOT is that these talented people have put themselves out there to share ideas that contribute to an intelligent and vigorous discourse. I often say art makes life make sense. And it’s exciting to have the opportunity to walk through an exhibit and reflect on difficult and controversial issues while enjoying the peace and beauty of this fantastic art space. In conjunction with the show, there is an exciting series of events including performances, workshops, talks and a film screening. About the surrounding area: There are shops and eateries close by, you can walk across the Brooklyn Bridge to get there, and best of all, right across the way there is a breathtaking view of Manhattan! The exhibition closes the last day of the year. Please visit smackmellon.org and follow them on social media @smackmellon. 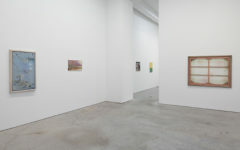 The gallery is located at 92 Plymouth Street, Brooklyn, NY 11201. Hours are Wednesday through Sunday 12-6pm. Contact: info@smackmellon.org and 718-834-8761. Exhibition Artists: Ebtisam Abdulaziz, Beverly Acha, Eddie Rodolfo Aparicio, Laura Arena, Anthea Behm, Yael Ben-Zion, Justin Blinder, Serra Victoria Bothwell Fels, Michele Brody, Hector Canonge, Cori Champagne, Cecile Chong, Esperanza Cortés, Linda Cunningham, Donald Daedalus, Ana De La Cueva, Alexis Duque, Carla Edwards, Nicky Enright, Jes Fan, Borinquen Gallo, Rebecca Graves, Katya Grokhovsky, Jon Henry, Peter Hoffmeister, Las Hermanas Iglesias, Jang soon Im, Ellie Irons and Anne Percoco (Next Epoch Seed Library), Sara Jimenez, Tahir Karmali, Shaun Leonardo, Monika Malewska,Yasmin Mistry, Guadalupe Maravilla (formally known as Irvin Morazan), Rachelle Mozman, Marcus Moore (the Homeless Poet), Christie Neptune, Quyên Nguyen-Le, Tara Pelletier & Jeff Kurosaki, Kenneth Pietrobono, Sunita Prasad, DaaPo Reo, David Rios Ferreira, Patrice Robinson, Diana Schmertz, Jessica Segall, Sayaka Suzuki, Jess X. Snow, Zhiyuan Yang, Seldon Yuan, Karolina Ziulkoski & Andrea Wolf. 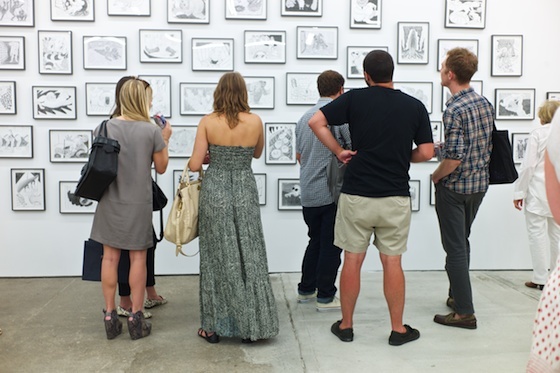 Kick off your December with a full weekend of artist programs here at Smack Mellon! We have events on Saturday, December 2nd and Sunday, December 3rd. All events are free and open to the public. You can RSVP to all events below.These programs are a part of UPROOT, the first show curated by our new Curator & Director of Exhibitions, Gabriel de Guzman. The exhibition and its full calendar of programs continue through December 31st. An influx DIY ephemeral residence-set will act as a site for visitors to enter and converse with artist Grokhovsky about the current state of immigration in the U.S. Acting as a record keeper of these interactions, the “inhabitant” adds text, sound, and video recordings to the installation that will activate conversations of displacement and process throughout the exhibition. This is a community engagement project based around storytelling, conversation and healing. The artist will be on-site to engage dialogue with visitors. Arena will provide an intimate space, a shelter to share her experiences around identity and home, from the perspective of a mixed race Native American woman. This shelter, inspired by her time at Standing Rock, also references the refugee and migrant crises happening all over the world. In this artist talk, Pietrobono leads a discussion on his ongoing artwork, A STRUCTURAL CRISIS IN AN EMOTIONAL LANDSCAPE, which raises money to pay writers to remove 30 artist-chosen words from their political/cultural texts for up to one year. Culled from editorials, campaign speeches, think pieces, sound bites, social media and news stories the terms are chosen for their emotional function to provide certainty and explanation in a time of – perhaps unbearable – structural uncertainty. Arranged via a contractual agreement with the artist, each writer is allowed to choose three words to keep, agreeing to remove the remaining 27 from published texts that engage directly with political and cultural current events that would have used a substantive amount of the terms. The artist talk will include a presentation from Pietrobono on the intentions of the phrase ‘A Structural Crisis in an Emotional Landscape’ and the questions raised by the removal of each term; questions that move beyond the “economy of explanation” and into the uncertainty of the times. Attendees will be invited to open discussion of the project and the broad cultural and political questions that seem to be unarticulated, all without use of the 30 artist-chosen words for the duration of the event. click here. To learn more about the project, please visit the artist’s site here. Thavma writes and directs for stage and film and has a background acting in commercials, independent films and plays. Her plays have been seen at the DC Black Theater Festival, Midtown International Theatre Festival and other venues. Although Thavma has lived in various areas of the U.S. and Puerto Rico, her work is primarily inspired by New York City where she was born and currently resides. She is expanding her writing career to include novellas, articles and blog posts, and has a passion for inspiring others to enjoy the arts. Merlin James: Paintings for Persons at Sikkema Jenkins & Co.